Recreational vehicles (RVs), whether they are motor vehicles or trailers that can be attached to or towed by a secondary vehicle, are significant business investments for an RV rental company. Considering that RVs can cost between $10,000 and $1 million (depending on the size, style, and features), it should come as no surprise that they also pose enormous temptations for motor vehicle thieves. With these significant costs in mind, what can RV rental companies do to mitigate theft and increase RV security? And how can an RV GPS tracking system help this endeavor? Park RV assets in secured lots, busy parking areas, or storage areas. Although this may seem basic, it helps to prevent RV theft by forcing a thief to think twice before attempting to steal an RV. Parking in an active, well-lit area means that a potential thief is more likely to be seen by passersby. However, parking in a busy area also increases the risk of an RV asset becoming damaged accidentally by a third party. This is why the other option would be to park in a more remote but secure area — one that requires access and approval. Install a fifth wheel lock on each unit when it is not in use. For fifth wheels and travel trailers, hitch locks are a great RV security measure. The device wraps around the hitch, beneath the trailer, helping to ensure that the fifth wheel can’t be attached to a thief’s vehicle hitch. Purchase a security system. Much like homeowners do with houses, some RV rental companies elect to install security systems in their units to increase RV security. Some systems include video feeds while others provide remote monitoring. Another way that RV rental companies are protecting their assets is by equipping each vehicle with an RV GPS tracker. GPS tracking, which uses orbiting satellites to triangulate the specific location of a tagged asset anywhere in the world, is an effective way for fleet and asset managers to keep an eye on their rental assets. Route alerts notify fleet managers when drivers deviate from their assigned routes. Convenient renewal reminders that can be set by mileage or date. In addition to tracking the locations of your vehicles using RV GPS tracking and geofencing, RV rental companies are armed with another weapon in the battle against RV theft or misuse: a remote starter disabler. This means that with select GPS devices, asset or fleet managers have the option of remotely disabling the starter on their tagged assets when a vehicle is used without authorization. It won’t deactivate it while the vehicle is in motion. However, once the RV is parked and its starter is disabled remotely, the vehicle can no longer be operated. 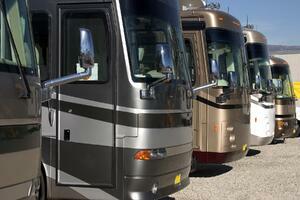 Don’t want your business to become one of the RV rental companies that fall prey to RV theft? Take control with RV GPS tracking for fleet management. Contact one of our project consultants today to schedule a demo by clicking on the link below.